Barramundi aquaculture methods vary from closed recirculating systems in the U.S. to open net pens and ponds in Southeast Asia, Taiwan and Australia. Farmed U.S. barramundi is a sustainable choice, while concerns remain over other barramundi farms. Native to the Indo-West Pacific regions from Southern China to Northern Australia, barramundi supports a large wild fishery that has experienced stock depletion. This estuarine species is a good candidate for aquaculture due to being fast growing and hardy. The typical lifespan of barramundi is 10-20 years, with the species reaching maturity at 2-7 years. This recommendation is specific to Australis Aquaculture Vietnam, an American company which operates an open net pen barramundi farm in the Van Phuong Bay in Vietnam. The Van Phuong Bay is characterized by sandy and muddy bottoms with no sensitive ecosystems (e.g. mangroves) nearby. The fish are stocked at very low densities of 13kg/m3 and water quality is extensively monitored. The majority of this product is consumed locally within Asia. US barramundi aquaculture is regulated by both state government and federal government. U.S. producers have developed and implemented a ‘Best Management Plan’. U.S. barramundi is farmed in closed recirculating systems. Producers use captive broodstock and bycatch is not a concern. U.S. farmed barramundi require a lower percentage of fishmeal and oil than other finfish and fisheries byproducts are often used in the feed. Barramundi can also be successfully raised on grain-based proteins and oils. These facts result in feed that does not put as much pressure on wild fish populations. Closed recirculation systems allow for the constant filtration and removal of solids, effective effluent treatment and low discharge rates. The risks of disease transfer and/or potential escapees are greatly reduced. 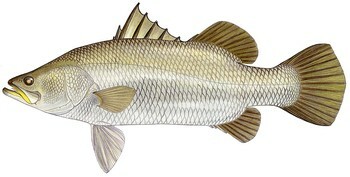 Barramundi is a widely distributed species, and is targeted by many countries by a variety of fishing methods. Currently, Indonesia lands the majority of barramundi, with other countries landing less than 1500 tonnes a year. Barramundi is not commonly imported into the US. Barramundi have life history characteristics that make them vulnerable to fishing pressure. Little is known about the population status as no stock assessments are performed and fishing mortality is unknown. This lack of information on the population status is of concern. Management is ineffective in Indonesia; primarily because of the scarcity of data without which no sound management measures can be made. There are no regulations in place to prevent bycatch, and as the extent of bycatch is itself unclear, it is unknown whether these regulations are needed. The bycatch of finfish is a serious concern. Finfish are caught most frequently in gillnets, are found in moderate amounts in pelagic longlines, and few finfish are caught by hook and line. Seabirds are also thought to be vulnerable to the barramundi fishery. Since the gear used to fish barramundi do not touch the sea floor, minimal habitat damage occurs. The removal of barramundi from the ecosystem is not known to have serious impacts. Management of open-pen farming in Australia has not been effective in addressing environmental concerns and detailed information on the management of open-pen farms in Southeast Asia is not available. Management of open-pen farming in Australia has not been effective in addressing environmental concerns and detailed information on the management of open-pen farms in Southeast Asia is not available. Flow-through systems release waste into the surrounding environment. The waste settles below net pens, often smothering sensitive habitats. Antibiotics and other chemicals used in culture operations are also released into the surrounding habitat.